Kyoto is best explored on foot. Buses can get crowded and local subway lines are not that extensive. The best area to stay in Kyoto for tourists is Downtown Kawaramachi. Other recommended best places to stay in Kyoto are Gion, Kyoto Station and Central Kyoto. Downtown Kawaramachi offers plenty of shops and restaurants, and is in walking distance to historical Gion, making it the best place to stay in Kyoto. If Kyoto is fully booked, book hotels in Osaka. Kyoto is only less than an hour away from Osaka via train. I’ve been to Kyoto for 4 times (and counting) and have stayed in different areas in the city. I have personally stayed at Royal Park Hotel Kyoto in Downtown Kawaramachi, Hatanaka and Maifukan in Gion, and Hotel Monterey Kyoto in Central Kyoto near Kyoto Station. Royal Park Hotel Kyoto is my favorite place to stay in Kyoto due to its unbeatable location in downtown! You will never get hungry with countless of restaurants nearby. Subway and bus stop are just a 3 minute walk away. In case you want to feel transported back in time, just cross the bridge and you’ll get to the cobbled historical streets of Gion in 10 minutes. 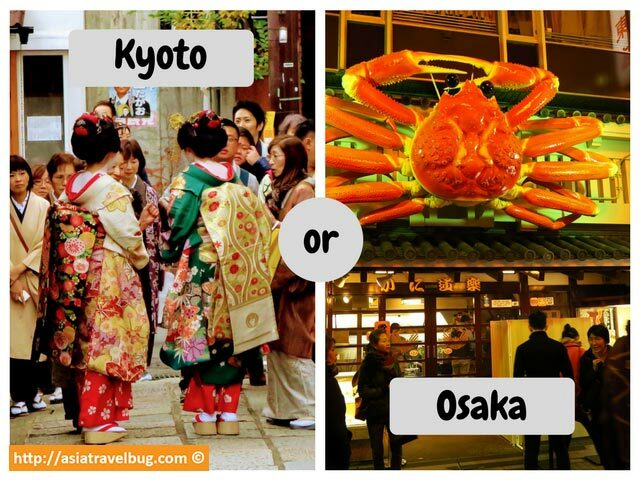 Where to Stay: Kyoto or Osaka? While staying in Osaka is cheaper and more central in exploring Kansai region, staying in Kyoto offers tourists a more authentic traditional Japanese experience. Having been to Kansai region several times, I’ve got the chance to base my hotel stay purely in Kyoto, purely in Osaka and a combination of both. My favorite base is Kyoto since I love nature and culture while my mother’s favorite base is Osaka due to food and shopping. Interested to stay in Osaka too? 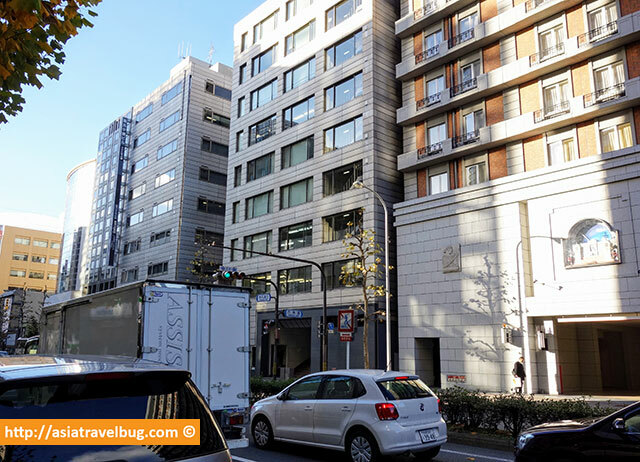 Check out Asiatravelbug’s Where to Stay in Osaka guide. For travel budget purposes, it is very important to know that Kyoto hotel rates vary widely depending on the season and the day you travel. Expect hotel rates to double or triple during spring and autumn seasons in Kyoto. A 3.5 star hotel which usually charges USD 150/night will charge at least USD 250/night during the super peak season. As someone living from a tropical country, most of my visits to Kyoto are during these super peak periods and I can say that the premium price tag is worth it. 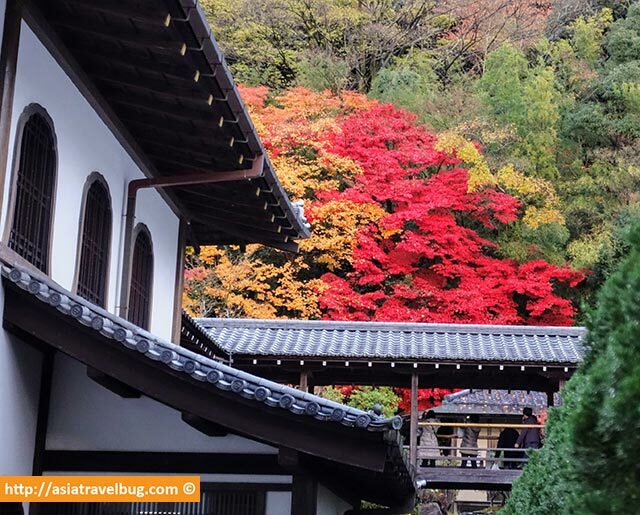 The cherry blossoms and the colorful autumn foliage really takes Kyoto’s charm from very good to fantastic! More than the pricey hotel rates, the biggest challenge in booking hotels in Kyoto for spring or autumn travel is the limited availability of accommodations. Hotels in Kyoto sell like hot cakes for peak season travel. It’s no surprise that 85% of hotel availability for April cherry blossoms period are already booked out by January. Same goes for autumn period travel wherein Kyoto hotels get fully booked out very far in advance. So I strongly suggest that you book your hotel at least 4 to 5 months ahead if you want to secure your rooms in Kyoto for peak season travel. Due to surge in weekend local tourism, expect to pay ~30% more on Saturday night stays compared to weekdays in Kyoto. Avoid planning Saturday night stays in Kyoto during the super peak season if you want to increase your chances in securing a room for your travel dates. 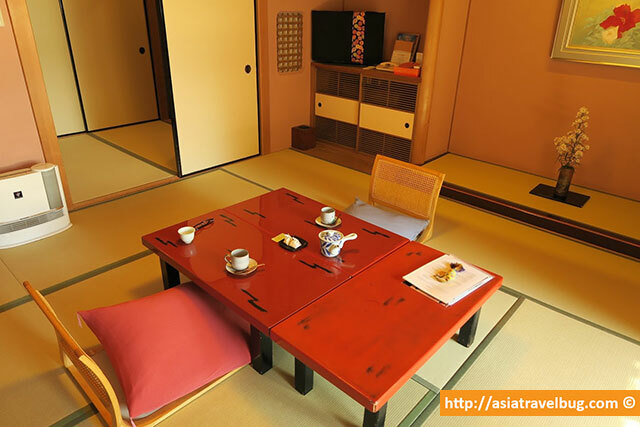 To avoid surprises, it is very important for you to know the room configuration before you book your accommodation in Kyoto. Double Room – Usually ranges between 15 to 18 sqm with one double size bed. One side of the bed is pushed against the wall. Double rooms are best for couples or for those who are in a budget. Twin Room – Usually ranges between 18 to 25 sqm for mid range hotels and between 28 sqm to 40 sqm for luxury hotels. Twin rooms are best for families or for those who value space. 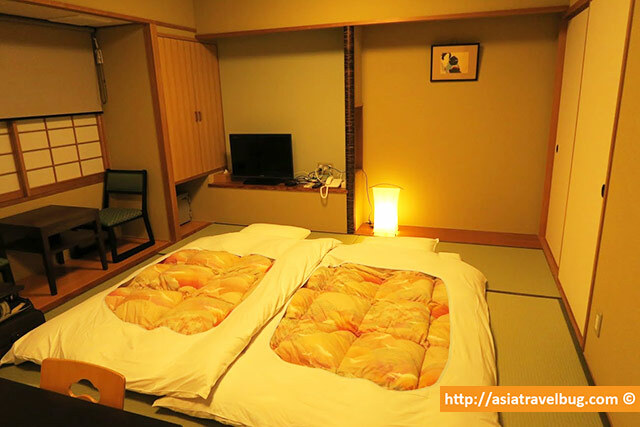 Japanese Style Room – You can find these rooms mostly in ryokans (Japanese Style Inns) but some hotels also offer Japanese style room as one of their room choices. You sleep on futon beds on the floor. Furniture is very minimalistic. These are best for those who want a deeper cultural experience in Japan. Don’t expect entire Kyoto to look entirely like the Old Kyoto which you see on TV with well-preserved century old houses and cobble-stoned streets with Geishas. 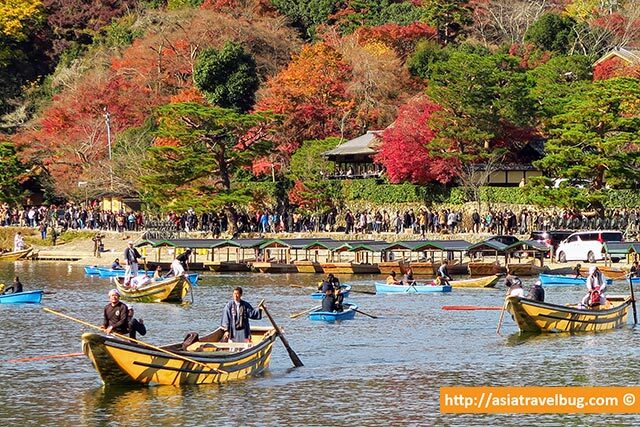 There are two main districts in Kyoto city which tourists usually go to. 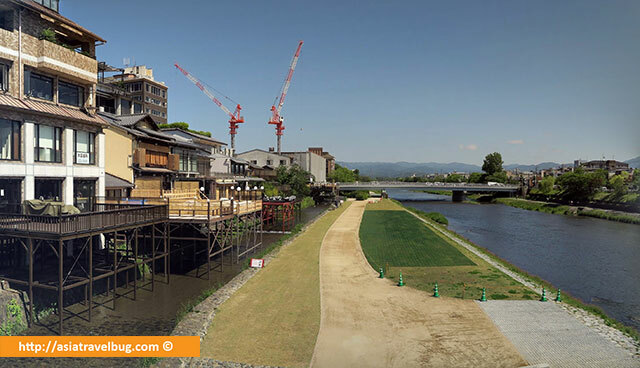 These two main areas are split by the beautiful Kamogawa River (Duck River). 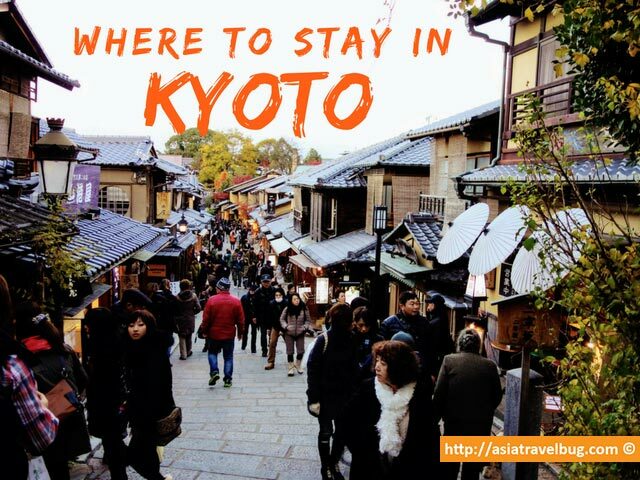 Let me describe these areas to help you decide where to stay in Kyoto. Higashiyama Eastern Kyoto (Old Kyoto) – Higashiyama generally represents Old Kyoto and it oozes with the Japanese traditional atmosphere which you imagine Kyoto to be. This is where you can find most of the beautiful temples and shrines, well preserved historical Japanese houses and cobble stoned streets. 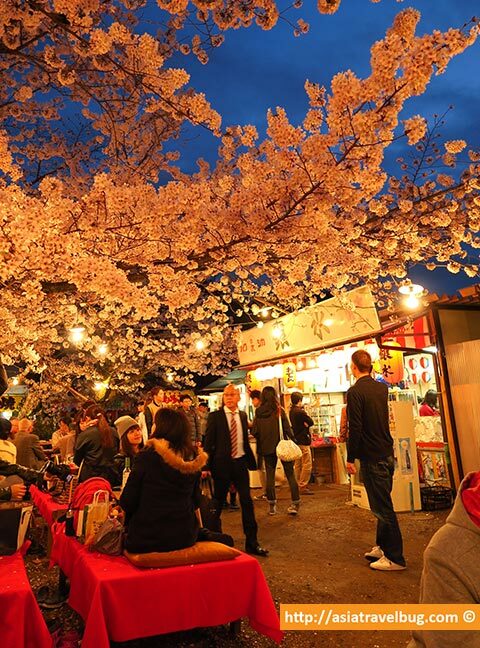 Most of the popular tourist sites can be found here including the historical Gion, the famous Kiyomizudera Temple, popular cherry blossom spots like Maruyama Park and Philosopher’s Path, and the fall foliage areas like Eikando Temple. The area is best explored on foot since buses are mostly crowded and subway lines here aren’t extensive. Although Higashiyama is beautiful during daytime, most of the family-run shops and reasonably priced restaurants here close very early between 5pm to 6pm leaving you with limited food choices at night. Central Kyoto (New Kyoto) – Central Kyoto lies to the west of Higashiyama area and includes Kyoto Station and Downtown Kyoto. Kyoto Station is the city’s major transport hub while Downtown Kyoto is the city’s modern shopping and entertainment area. Although these areas do not offer the local Japanese traditional atmosphere which you have on your mind, these areas offer all the conveniences of a modern city while still having an easy access to Higashiyama (Old Kyoto). 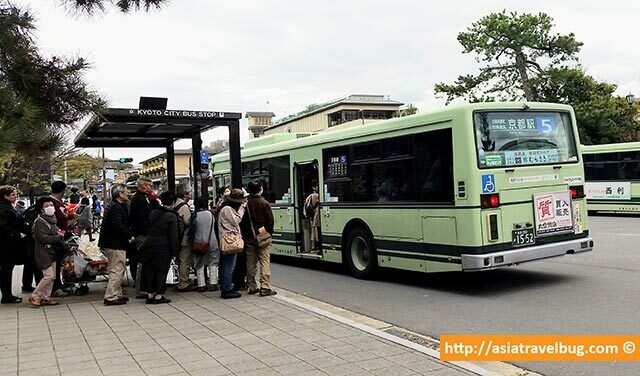 While it’s true that local buses are very cheap in Kyoto offering tourists unlimited ride for JPY 500 (~USD 5) per day, it can get very much crowded and very slow taking away much of your precious vacation time. This is also true for non peak season travel which I’ve experienced first hand during mid May. However, this does not mean that you have to skip the bus entirely. I suggest you to use the bus as needed which includes getting to sights which are not serviced by train or subway like Kinkakuji Temple. If you want to maximize your vacation time, the most efficient way to explore Kyoto is either by taking subways / trains and by walking. Explore nearby sights on foot. Take the subway or train to reach farther destinations. So it is very important to pick a hotel that is within 5 to 10 minutes walking distance to a subway or train station within the city center. 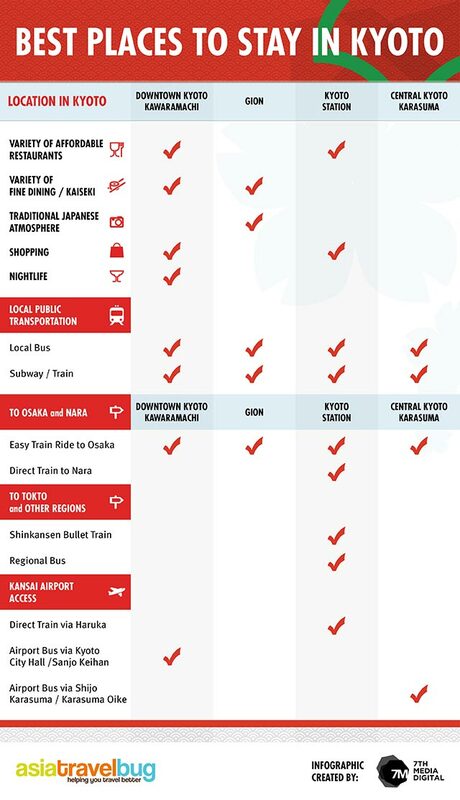 Here are the most strategic stations in Kyoto for tourists to base in. I have highlighted these in yellow for easy reference. Following my personal experience in my 4 past visits to Kyoto and having experienced the city during spring, summer and autumn, the best area to stay in Kyoto is Downtown Kawaramachi. Downtown Kawaramachi is right in the center of Kyoto’s modern bustling area yet still in short walking distance to Gion where you can experience Old Kyoto. Other recommended areas to stay in Kyoto for sightseeing are Gion, Kyoto Station and Central Kyoto Karasuma in descending order of preference. Based from my personal experience, Downtown Kawaramachi is the best area to stay in Kyoto as it provides all the conveniences of a modern lifestyle and yet it is just 10 minutes walk to Gion (Old Kyoto), allowing you to enjoy the best of both worlds! Being in Downtown Kawaramachi allows you to explore most of the major sights in Downtown and in Higashiyama District by foot. Staying in Downtown Kyoto Kawaramachi will save you a lot of TIME, MONEY and EFFORT. Its prime location will allow you to spend more time on sightseeing, have less time wasted on slow and crowded buses, and save you money on cost of traveling to sights and restaurants everyday. If you want to maximize your precious vacation time, then Downtown Kawaramachi is the best area to stay in Kyoto. 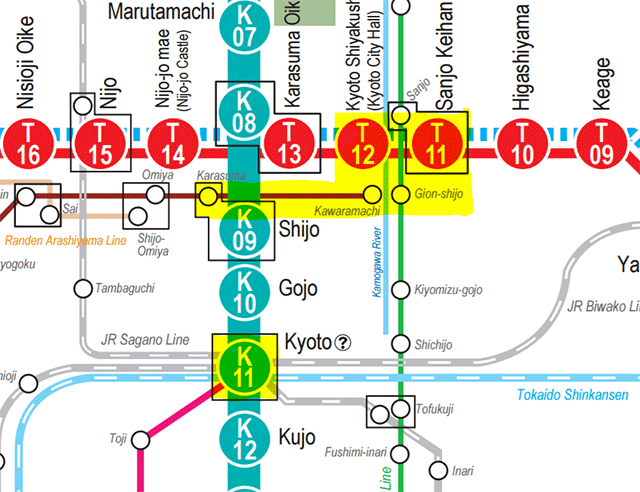 Stay in a hotel near these stations if you want to be in the middle of all the action yet in walking distance to Gion. All of these stations are in Downtown Kawaramachi or are very near to it. Highly convenient location with easy access to subways and local bus. Most of tourist destinations in Kyoto city, Kyoto suburbs (Arashiyama) and Osaka can easily be reached by public transport. 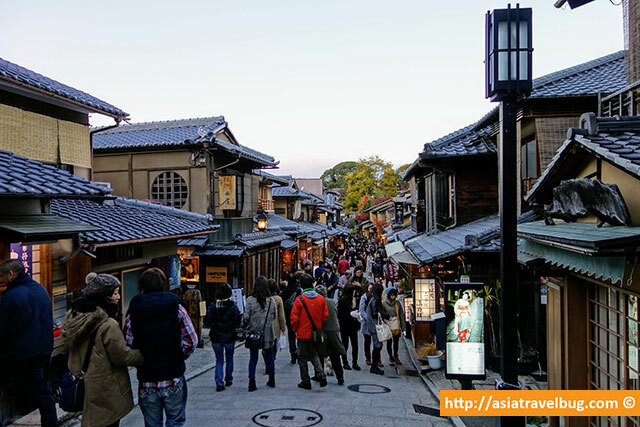 Quick access to historical Gion and Higashiyama District which is just 5 to 15 minutes walk away. Just a short 10-minute taxi ride away from Kyoto Station if without traffic, with average cost of JPY 1500 (~USD 15). Hotels in Downtown Kawaramachi are cheaper than those in Gion. Plenty of reasonably-priced restaurants, shops and convenience stores. Commercial area which is more lively at night compared to the rest of Kyoto. Just like any other downtown in any city, space is highly prime in Downtown Kawaramachi. One possible downside of staying here is that rooms in mid-range hotels could lack cabinet to store clothes. However, the benefits of staying in Downtown Kawaramachi far outweighs this minor drawback based on my personal experience. If I’m given the chance to redo my first 3 trips to Kyoto, I would definitely choose to stay in Downtown Kawaramachi with Gion being the second choice. Royal Park Hotel The Kyoto (3.5*) – After staying in 4 different accommodations in the city, this boutique hotel is my top choice as the best place to stay in Kyoto. I highly recommend it due to its unbeatable location! Despite not being a 100% perfect hotel, it’s the best you can get in Downtown Kawaramachi at its affordable mid-range price. Restaurants, groceries, coffee shops, convenience stores and small shops are literally outside the hotel. Subway and bus stop to get to farther tourist sites are just a 3-minute walk away. 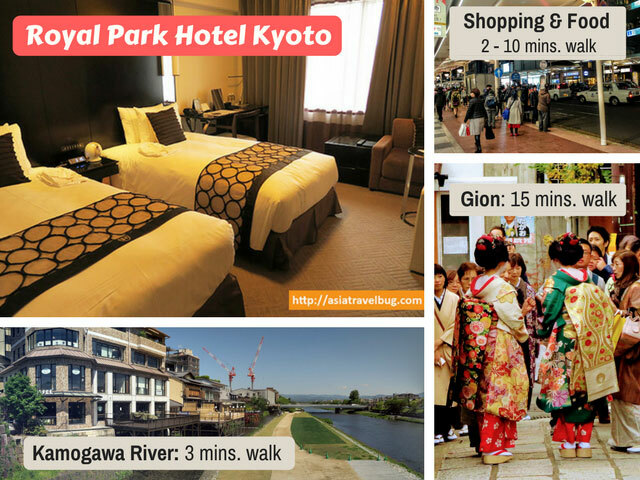 All major tourist sites in Downtown and Gion are all within 5 to 15 minutes walking distance. Situated on Sanjo Dori (3rd Avenue), you can experience a more laid back atmosphere here than the busy main shopping strip on Shijo Dori (4th Avenue). I stayed in a Deluxe Room which was of reasonable size, though for me, it did lack some clothes storage. At 25 sqm and USD 130/night, it was a very good price in a very prime downtown location in Japan! If you prefer a little more space, I recommend the Corner Deluxe Room which offers 31 sqm from USD 160/night. Triple rooms are also available for families or groups. Book in Agoda or Booking.com before the rooms get sold out! Hotel Grand Bach Kyoto Select (3*) – If Royal Park Hotel Kyoto gets fully booked, consider Hotel Grand Bach Kyoto due to its central location right in the middle of Shijo Dori (4th Avenue). I personally think that this hotel is the next best place to stay in downtown Kyoto after Royal Park Hotel. Staying in Shijo Dori in Downtown Kawaramachi Kyoto is equivalent to staying right in Orchard Road in Singapore, Ginza Shopping Street in Tokyo or 5th Avenue in New York. There are many department stores, restaurants and shops all around. In addition, this hotel is only a 10-minute walk to the historical Gion. It is very convenient for transportation with 2 subway stations a mere 5-minute walk. There are also plenty of buses departing from Shijo Dori to all other tourist sites. After a long day, guests appreciate the powerful showers with body jets and the free light Japanese snacks at night. This hotel does have Standard Rooms though they are very small. For more space to move around, book the 23 sqm Deluxe Room with rates from USD 160/night. 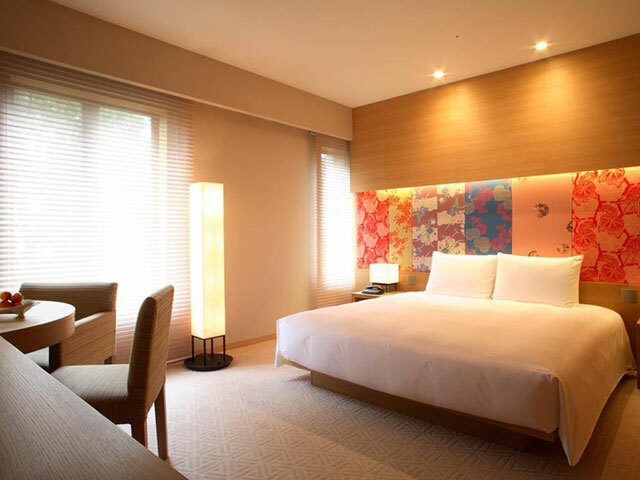 Solaria Nishitetsu Hotel Kyoto Premier (4*) – This is one of the rare hotels in Downtown Kawaramachi that’s facing the lovely Kamogawa river with a reasonable price. 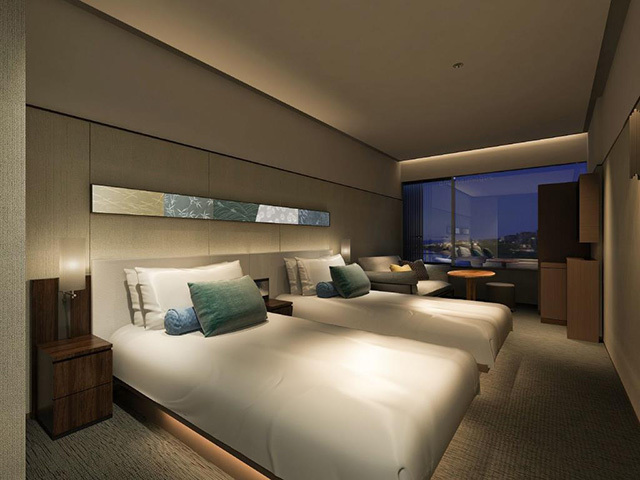 Situated on the same river bank as the luxurious Ritz Carlton Kyoto, Solaria offers zen-like ambiance, at the fraction of the price of Ritz, with an even better location! Despite the peaceful location at the edge of Downtown Kawaramachi, subway stations, bus stops, restaurants, shops, and Gion district are all within a 5 to 15 minutes walk. 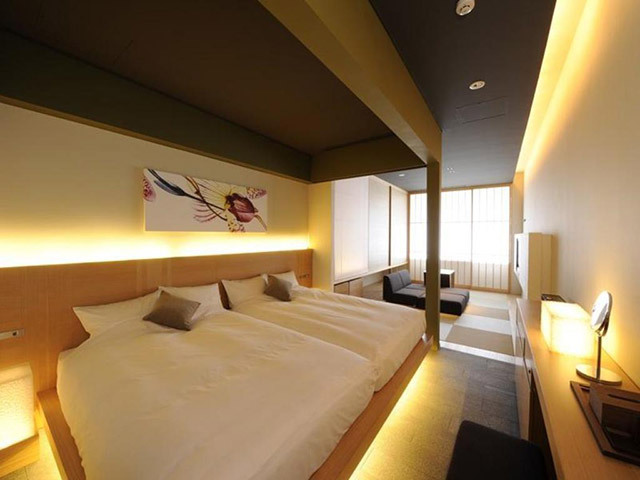 Seriously, this brand new hotel makes me want to pack my bags and head to Kyoto now for some needed relaxation. I recommend the 26 sqm River View Twin which comes with an unbelievable opening promotional rate from USD 140/night. Book in Agoda before prices increase! Hotel Gran Ms Kyoto (3*) – This no frills hotel is perfect for those who need more space at Downtown Kawaramachi with a budget price. I would recommend this hotel for families or groups on a budget and are not looking for luxurious features. In Downtown Kyoto, rooms over 30 sqm are very rare. So for a 32 sqm Deluxe Twin with rates from USD 120/night, this hotel cannot be beaten! And then there’s the 42 sqm Deluxe Room with Tatami Area – perfect for larger families or groups who want to stay close together. This room can sleep up to 6 and costs from USD 350/night. Are you heading to Kyoto and Tokyo too? Check out Asiatravelbug’s Where to Stay in Osaka and Where to Stay in Tokyo guides. Read on the rest of this blog to learn why Gion, Kyoto Station or Central Kyoto can be the best area to stay in Kyoto for you. For me, the next best place to stay in Kyoto is Gion due its great traditional Japanese atmosphere and its highly strategic central location. Gion is right in the middle of the historical district Higashiyama which enables you to access most of Kyoto’s prime tourist sites easily on foot. 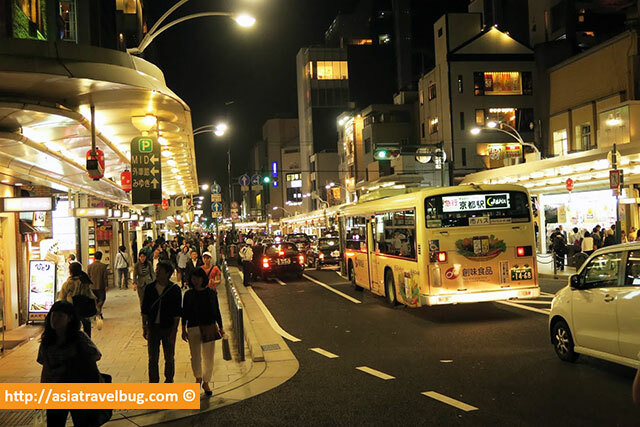 Although there is little night time activity in Gion, you can always walk to Downtown Kawaramachi from Gion to access more reasonably priced restaurants at night. Gion in Kyoto is highly well known as the Geisha District in Japan. However, it is important to know that the area is not a red light district which most people thinks it to be. It is family friendly just like Downtown Kyoto and Kyoto Station. If you wish to spot a Geisha, Gion offers you the best chance to see a Geisha strolling on the streets between 6pm to 8pm. It is very hard to spot a Geisha in Kyoto as most of them walk very fast for work. Highly convenient location in the heart of Higashiyama (Old Kyoto). Most of the major tourist sites, famous cherry blossom areas and popular fall foliage sites in Higashiyama or Downtown Kyoto can easily be accessed on foot, by bus or by short taxi ride. Great traditional and historical Japanese atmosphere as you see on TV, perfect to soak in Japanese culture. Some tourists also wear kimono or yukata (summer kimono) for sightseeing making the streets look more charmingly Japanese. Perfect for Geisha spotting. Higher chances of seeing a Geisha strolling on the streets if you stay in Gion. Good variety of ryokans and machiyas (Japanese style inns and holiday homes) in the area. 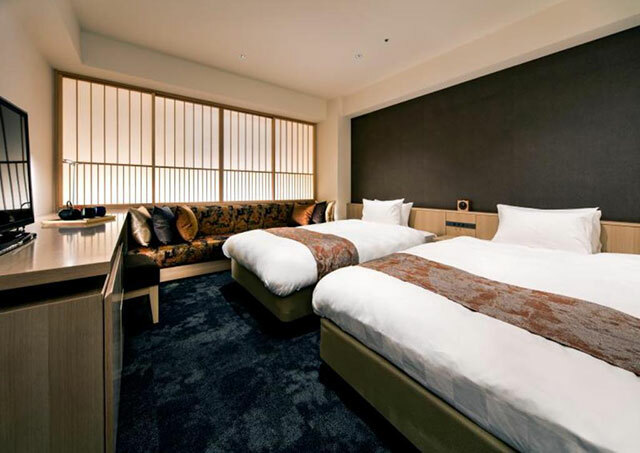 Hana Touro Hotel Gion (4*) – This newly opened boutique hotel sits on an unbeatable location in Gion, just 2 minutes walk from the Geisha District, and 10 minutes walk from the busy downtown. The western style rooms have Japanese touches and bathrooms are luxurious with wooden pine bath tub. Considering that this is a newly constructed hotel in a great location, rooms are affordable from USD 180/night for a 29 sqm Standard Room. Triple and quad rooms are available for families or groups. Gion Maifukan (3.5*) – For those who want to experience sleeping on futon beds, stay in Gion Maifukan without the high price tag of an authentic ryokan (Japanese Style Inn). Set in the quieter part of the historical Gion, this hotel is still only 15 minutes walk to the bustling downtown while most of the historical sites are within a 15 to 30-minute walking radius. 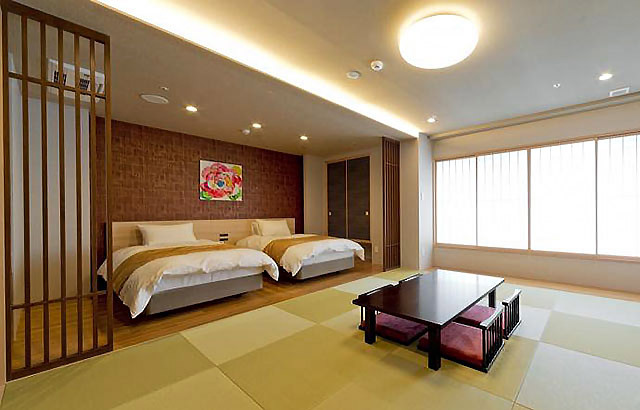 Choose from a Japanese Style Room complete with futon beds or opt for the Western Style Room. Though not a ryokan, the Japanese Style Room where I stayed offers a good introduction to traditional Japanese accommodations, at a more reasonable price. The Japanese Style Twin is functional for two people at 20 sqm starting from USD 180/night. Gion Hatanaka (4*) – Perfect for travelers who want an all-in Japanese experience covering fine dining Kaiseki meals and accommodation. Gion Hatanaka is a 4-star, full service modern ryokan where you have a dedicated personal service attendant from check-in to check-out, and you sleep on traditional futon beds. 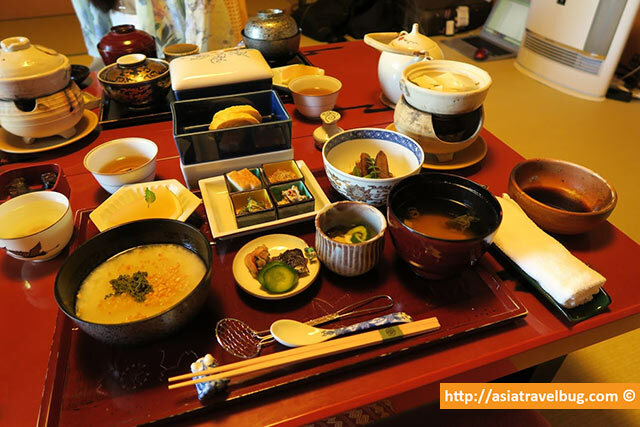 I’ve personally stayed here and enjoyed their very delicious Japanese Kaiseki breakfast! The Kaiseki dinner was beautifully presented perfect for sashimi lovers. On the surface, this accommodation appears very expensive with prices from 550 USD for a 40 sqm Japanese Style Room, Kaiseki dinner and Kaiseki breakfast for two. But when you consider the cost of a good Kaiseki dinner in a nearby restaurant which is at least USD 150 per person, then the half board rate of Gion Hatanaka is quite reasonable. Set in the quieter part of Gion steps away from Maruyama Park, the ryokan is within walking distance to the tourist sites of Higashiyama and downtown. This ryokan should be perfect for couples or families with older children. 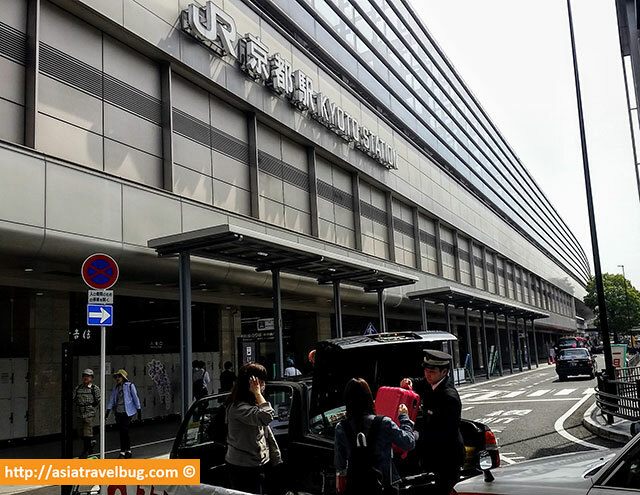 Although Kyoto Station is not walking distance to prime tourist areas and the area immediately surrounding it offers little touristic activity, all modes of transportation are available under one roof making Kyoto Station a convenient hub for travel. Highly convenient for public transport. Kyoto Station’s trains, subways, Shinkansen bullet trains, taxis, and buses allow you to get to anywhere easily. Plenty of reasonably-priced restaurants and shops. More hotel choices compared to Downtown Kawaramachi and Gion. Staying within and to the north of Kyoto station provides easier access to the bus terminal for getting around to tourist sites. 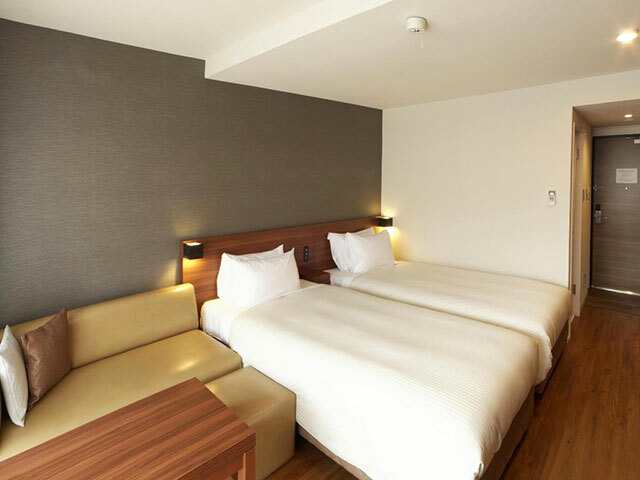 Hotel Granvia Tokyo (4.5*) – Located within Kyoto Station, this hotel is convenient for travel and has easy access to shops and restaurants without having to go outside. Despite being above the station, guest rooms are quiet and restful. 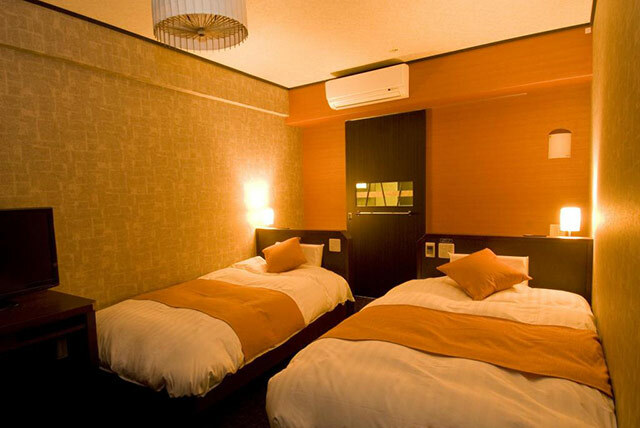 Their Standard Twin is the best value room in Kyoto Station area – generously sized at 30 sqm, with nightly rates from USD 110 for two, and USD 165 for triple. Superior rooms are likewise available starting from USD 140/night. 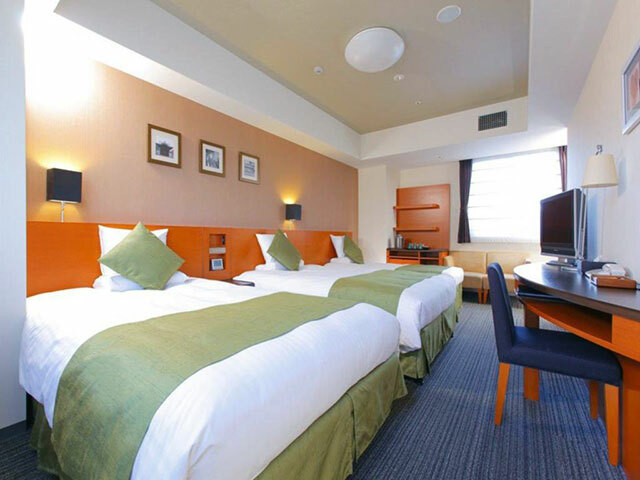 Dormy Inn Premium Kyoto Ekimae (3*) – Previous guests love the onsite hot spring and the free ramen nights. Apart from being close to Kyoto Station, a convenience store is right at the ground floor of the hotel. Book a 21 sqm Twin Room for more space. Rates for Twin Rooms start at USD 140/night. Daiwa Roynet Kyoto Ekimae (3*) – This newer hotel is sparklingly clean and is right next to Yodobashi Camera perfect for gadget lovers. Their Standard Twin Rooms measure 23 sqm with prices starting at USD 140/night. 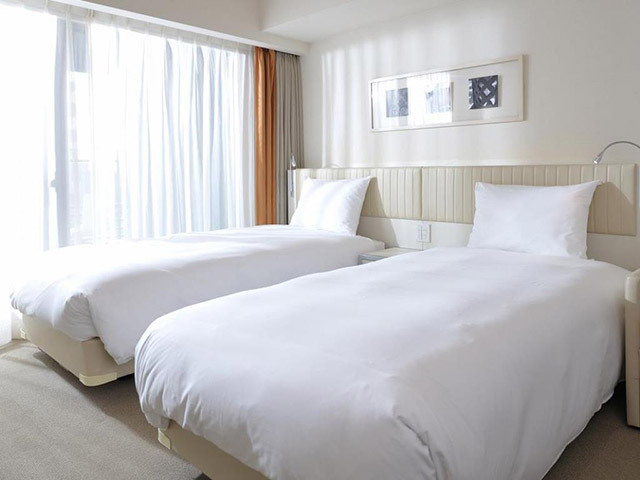 New Miyako Hotel (3.5*) – Just across the south of Kyoto Station and beside a huge mall, staying here is convenient for transportation and dining. 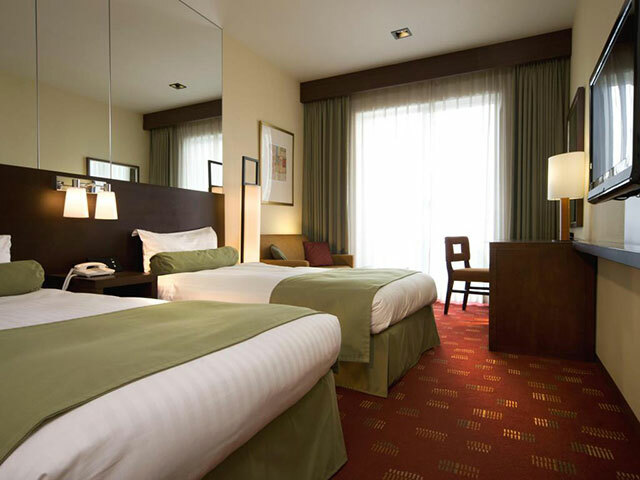 This is a large hotel yet guests are made to feel welcome and cared for by the attentive staff. The Moderate Twin Room is a good choice at 23 sqm, with rates starting at USD 140/night. 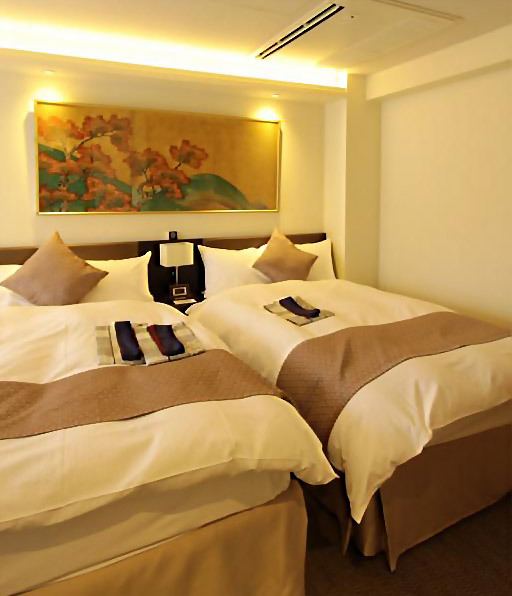 Sakura Terrace Gallery (3.5*) – A hip adult-only hotel that’s perfect for couples or group of friends. Previous guests have raved about the free welcome drink each night and the free flowing complimentary brewed coffee and tea all day. The Standard Twin is compact at 19 sqm but prices are very reasonable from USD 99/night. For those who need more space, book the 25 sqm Deluxe Twin from USD 140/night. 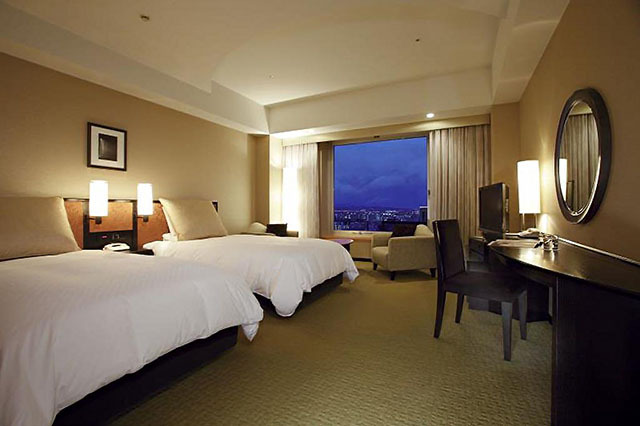 Hyatt Regency Kyoto (4*) – As you would expect from the Hyatt Regency name, this Kyoto hotel offers a little more luxury for the discerning traveler. There’s even a Maiko (apprentice Geisha) who will happily be available for photos in the lobby each evening. While the hotel is not within the immediate vicinity of Kyoto Station, it’s just a short bus ride away. 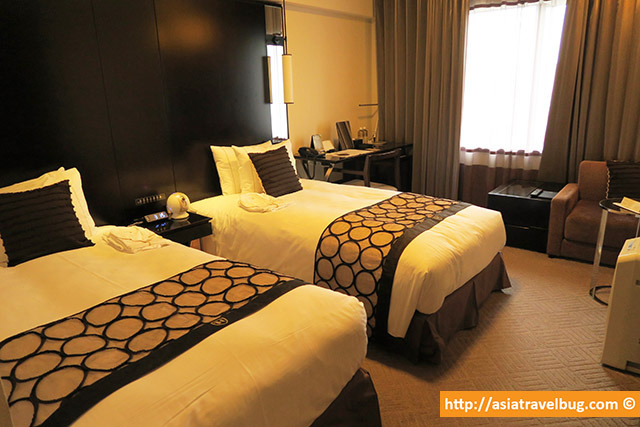 A Twin or a King Room measures a generous 28 sqm with rates from USD 310/night. Karasuma Dori is the main central avenue in Central Kyoto which starts from Kyoto Station. Although it is generally not a lively area and is not walking distance to prime tourist sites in Higashiyama District, it is easy to get to Kyoto Station and other areas using the Karasuma Subway Line. The area is of mix use dotted variedly with office buildings, with some temples with some shops and restaurants here and there. Back streets to the left of Karasuma Dori are mostly residential neighborhoods where you can see the normal way of life of locals. To the right of Karasuma Avenue intersecting Shijo Avenue is the lively Downtown Kyoto. 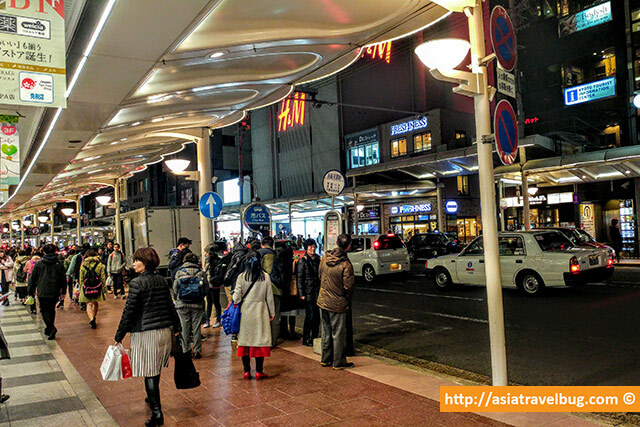 Since Karasuma Dori is generally not in a prime downtown area except for the area right in the intersection of Shijo, there are plenty of hotels to choose from here that are cheaper or with better room size compared to Downtown Kyoto. 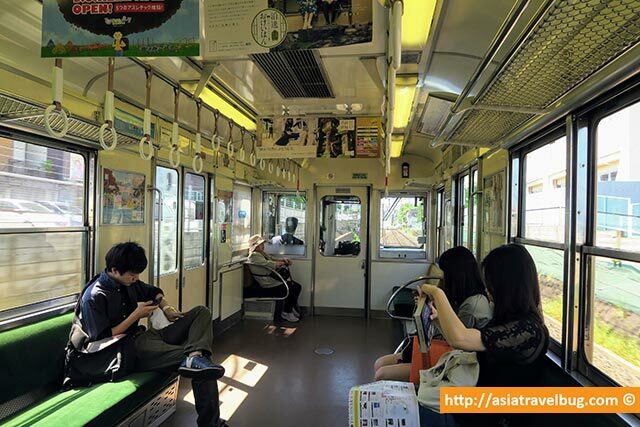 Easy transport to Kyoto Station and other tourist sites via Karasuma subway line. Hotel rates are generally cheaper than Downtown Kyoto and Gion. High hotel room availability for reasonably priced hotels compared to other areas. Citadines Kyoto Karasuma Gojo (3.5*) – A good choice for families, for those with longer stays or for those with dietary restrictions. Rooms at this hotel feature a kitchenette. The location is also convenient, right next to Gojo subway station which can take you major attractions easily. Kyoto Station can be reached in one subway stop and Kiyomizudera in 20-minute walk. Although not as lively as Downtown,the immediate area of the hotel is sufficient with a supermarket, convenience store and affordable eateries nearby. The Studio Twin is spacious at 25 sqm with affordable rates from USD 120/night. 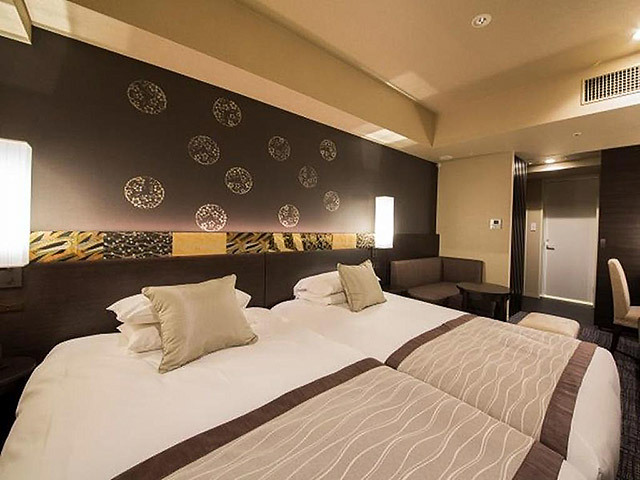 Hotel MyStays Kyoto Shijo (3*) – This hotel is a popular choice for budget conscious travelers and is located within 10 minutes walk from Downtown Kyoto. Although farther from Higashiyama historical district, the hotel is close to a bus stop and the subway for getting around the city. Also, there is a supermarket nearby if you want to buy food. Rooms are affordable at USD 110/night for a 22 sqm Superior Twin. For more space, choose a 30 sqm Deluxe Triple at USD 150/night. Hotel Kanra (4*) – If you are looking for a luxurious boutique hotel with a pleasant mix of Western and Japanese architecture, go for Hotel Kanra. 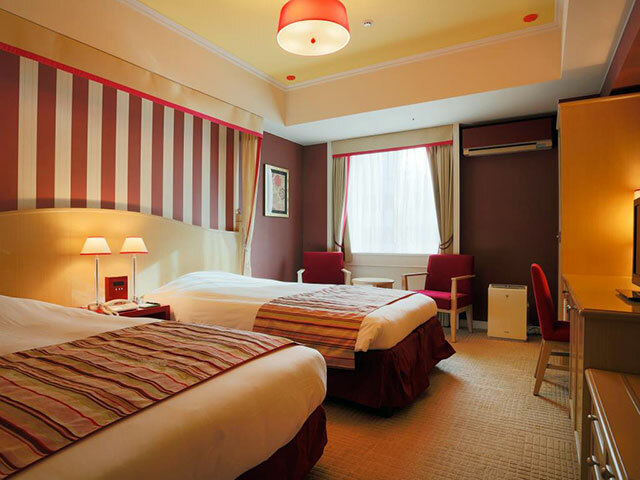 The hotel is located just 5-minute walk from Gojo subway station and 15-minute walk from Kyoto Station. The rooms here are spacious and bathrooms feature luxurious wooden baths. The Twin Room is highly spacious at 46 sqm. Prices vary depending on number of occupants, from USD 340/night for two people, up to USD 550/night for five. The hotel is best for couples or families. Hotel Monterey Kyoto (3.5*) – I’ve personally stayed here in my first trip to Kyoto. Although the immediate area is mostly office buildings, the nearby Karasuma Oike subway makes visiting major tourist sites in Kyoto a breeze. Nishiki Market and the main shopping strip Shijo Dori are just 15 minutes walk away. There are convenience stores next to the hotel for affordable snacks or breakfast. Twin Rooms offer 22 sqm and are from USD 150/night while a Triple offers 26 sqm from USD 190/night. Kyoto has lovely suburbs like Arashiyama, Uji, Kurama, and Kibune. Arashiyama is a beautiful suburb west of Kyoto and tourists normally go there to see the famous Bamboo Groves and to see amazing cherry blossoms and autumn fall foliage. Uji is located a little south of central Kyoto and is well known for green tea. Kibune and Kurama are located north of the city and are known for hiking and onsen. Although these are charming areas in the suburbs, these locations in Kyoto are quite far from all the action and aren’t strategically central for tourists to base in for a couple of days. These areas are best for day trips or for a relaxing one to two-night stay in a ryokan (Japanese style inn). Check out Asiatravelbug’s Where to Stay in Osaka guide to learn the best places to stay in Osaka. But don’t delay your booking too late as hotels in Osaka can get sold out too if you’re traveling during spring or autumn. For peace of mind and less stress, I recommend booking hotels in Osaka, as an alternative to Kyoto, at least 3 months in advance. Heading to Tokyo too? Check out Asiatravelbug’s Where to Stay in Tokyo Guide. Interested to stay in Osaka? Check out Asiatravelbug’s Where to Stay in Osaka blog post. Coming from Kansai Airport to Kyoto? Don’t worry! Check out how I got to Kyoto from Kansai Airport using the Haruka and Icoca Pass. Have you picked the hotel where you will stay in Kyoto? Asiatravelbug recommends booking in Agoda for best rates in Kyoto. Need more time to decide where to stay in Kyoto? Bookmark this Where to Stay in Kyoto Guide or Pin below image for later reading! If you have any suggestions on other best areas to stay in Kyoto, please feel free to share your comments below. Need help from your travel buddies to decide the best place to stay in Kyoto? Share this Where to Stay in Kyoto Guide with them using the social share buttons below! My family of 5 with us parents plus our 21-yo & 17-yo college kids, plus my 93-yo very healthy mother, are traveling for 10-12 days arriving May 25. So far we are booked at the Noku Kyoto followed by the Millennium Mitsui Garden Ginza in Tokyo, with 2 rooms each with 2 or 3 twin beds. Besides seeing temples/shrines/museums, we plan to do 3hr to 4hr dayhikes just outside each city, with my mom staying behind except for the Philosophers Walk in Kyoto where I’m hoping she can walk/ride (in a wheelchair, just for when she’s tired). 2) Just found out that there is the new vs the old fish market, with the old one (Tsujiju) being near our hotel. Which do you recommend that we visit? 3) My mother can walk but tires quickly due to bad knees so we are bringing a wheelchair for her. Will the subways in both Kyoto and Tokyo be conducive for travelling with a wheelchair, or should we take a taxi (perhaps 3 ride in the taxi, and 2 take the subway)? 4) Do you think it would be worth the time and money to travel to Miyajima for a dayhike to Mt Misen (and also see Hiroshima, where my mother’s parents were born)? 5) Which are must-see gardens for my mother? Thanks for leaving a message and sorry it too a while for me to respond. See my answers to your questions below. 1) The sequence between Tokyo and Kyoto would not really matter, so you may book the flight schedule which is more convenient to you. However, it would be best to have an open jaw flight (arrive Tokyo, depart Kansai or vice versa) so you avoid a u turn. 2) The restaurants in the old fish market (Tsukiji) remain to be there, so it’s still a place that’s really interesting to go to. I’ve not been to the new Toyosu fish market yet. But if you’re an early riser, you can catch the tuna auction there at around 5:30am with advance booking. 3) Regarding elevators in subway/train station in Kyoto and Tokyo, it actually depends on the station. Older stations, like the Ginza line, tend to be less wheelchair friendly. Some stations only have elevator in one exit, like the one right outside Millennium. So in your case, given you are with your 93 year old mother, a taxi would be much more convenient. Taxis for short distances in Tokyo are not that expensive. In fact, they decreased the flag down rate some years ago. So taxi cost between Tokyo Station and Ginza would only be around 1000 yen or even less. On the other note, Ginza has wide side walks so its a wheelchair friendly area. 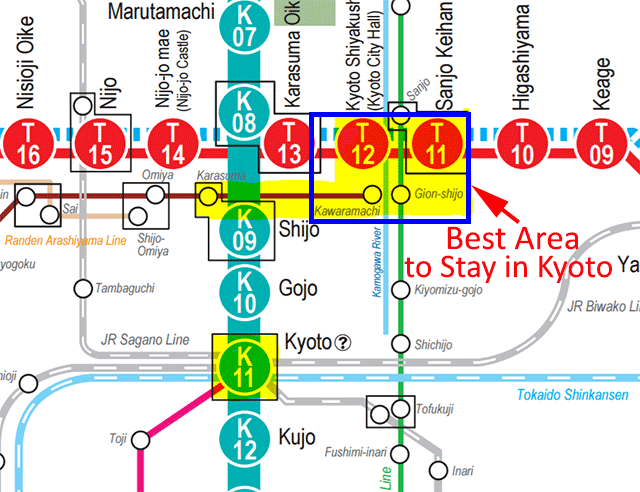 3b) For Kyoto, I think you could stay in a better area in Downtown Kawaramachi. Kawamachi has wide sidewalks like Ginza and it’s also very central to walk to tourist sites from there, while still being near to restaurants. If it is not yet too late, you may wish to consider staying at the newly opened Cross Hotel Kyoto in Downtown Kawaramachi which has same pricing as Noku but in a much much better location. For Philosopher’s Path, there is a non-active small road beside the canal. 4) Miyajima is a lovely place to visit on a good day. Without doing any hiking, I was able tour around Hiroshima and Miyajima in a day from 9am to 6pm. You just need to start your trip early at 9am or earlier at Hiroshima Station. If you’re doing some kind of hiking, I think you will need more than a day to tour around both Hiroshima and Miyajima. 5) The parks in Tokyo and Kyoto are pretty vast. Some of my favorites are Meiji Jingu, Shinjuku Gyoen and East Gardens of Imperial Palace in Tokyo. I would suggest though to pick one, if you really want to go to a park, as it can be tiring for your mother. In my honest opinion though, the parks in Tokyo and Kyoto look much more beautiful during cherry blossom and autumn foliage season compared to May. Hope this helps and wishing your family a great trip to Japan this May! I am traveling to Japan end of this December with my family (husband and 3 young adults). We have 4 days in Kyoto before continuing on to Tokyo and would like to organize a guide and excursions in Kyoto. Do you have any guides that you would recommend. Also we would love to do a private in home traditional cooking class dinner but cannot seem to find one. We would greatly appreciate any help with planning. In terms of tours in Kyoto, please find my recommendations below. 1. Night Walk in Gion – I’ve tried this myself and can highly recommend this tour. 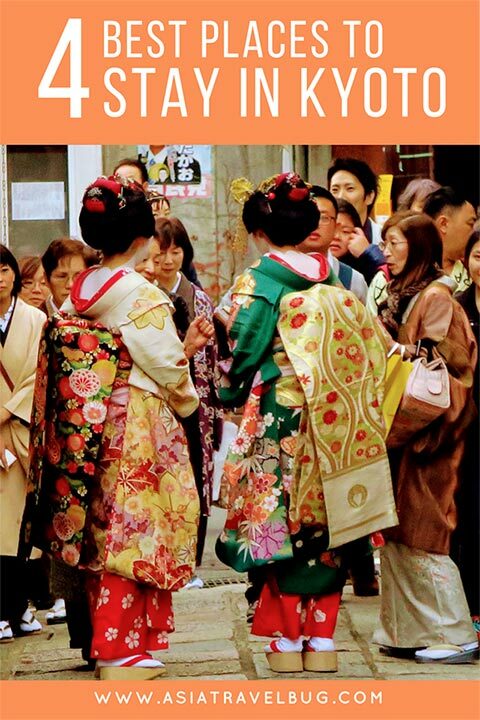 Aside from being very affordable, the guide is fantastic, very engaging and has a ton of information about Geishas. She even gave us some tips on how to spot real Geishas or Maikos (trainee Geishas) in Gion. 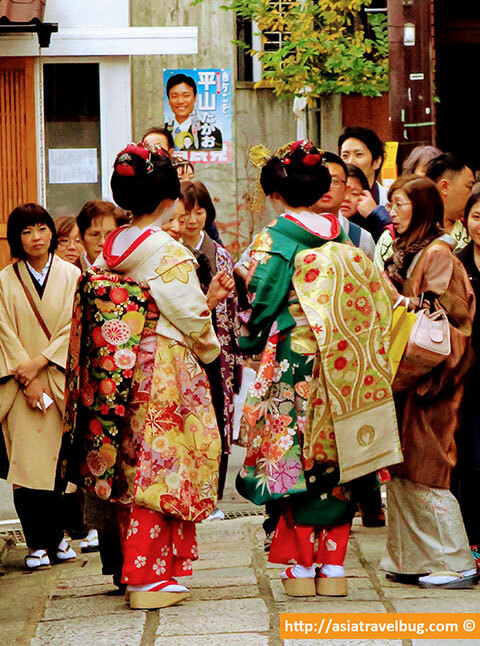 We’re lucky to have spotted two Geishas in the backalleys with the tour guide’s help. This tour is not to be missed. 2. Japanese Cooking Class in Kyoto – My brother has personally been here before. Cooking instructors are locals so you’ll be assured of an authentic local Japanese cooking experience. The location is not bad either just 10-minute easy walk from Karasuma Shijo Station in Downtown Kyoto. 3. Kyoto Walking Tour with Last Samurai – This should be a very unique and very memorable walking tour in Kyoto with Samurai Joe. I wish you and your family a wonderful Christmas trip to Japan!